Today we are celebrating CALL SIGN KARMA, a contemporary romance title by debut author Jamie Rae. Be sure to check out the excerpt and contest below! It didn’t seem fair for the angel and the devil on my shoulders to gang up against me last night. I didn’t know whether to hug them or smack them. I squeezed my eyes closed and my pulse thumped loudly in my head. A low moan escaped my lips as I pulled my pillow over my face and rolled over. The rich spicy scent of his cologne lingered causing my heartbeat to quicken. I slowly peeked from under the pillow. Disappointment tugged at my belly. I can’t believe I don’t know your name. Or did you tell me and I suffered from amnesia due to my head injuries? Either way you owe me a date to make up for the way you treated me last night. I’ll pick you up after work around 6:30. I popped the Tylenol into my mouth and downed the entire glass of water. After rereading the note, I folded it into its plane form and sailed it into the air. Ironic. As I swung my legs out from under the sheets, I discovered an expertly dressed bandage on my foot and I wondered how he didn’t wake me. Especially since every time he touched me my body erupted like a volcano. My face lit fire as a satisfied grin tugged at my cheeks. I should hate this day. I had dreaded its arrival for so long, but I intended to enjoy this moment while it lasted. For the first time in over a year, I felt alive. I hadn’t allowed anyone that close to me, but Locke felt different. Just the thought of him made my stomach bottom out. Feelings equaled pain and I promised myself that I would never allow my heart to be broken again after Colin’s death. I couldn’t risk losing someone that I loved ever again. Locke was danger. Serious danger. I tugged the blankets over my head and rolled over. The sandalwood scent sent my heart into a flurrying panic. After a shower and breakfast, I stepped into my flight suit and laced up my boots. The pain in my head was replaced by an ache in my foot. I pulled my hair back in to a ponytail, then wrapped it into a bun. I took my phone from the plastic container. A text from Pink 1 wishing me luck again and a calendar alert that read ‘doomsday’ lit up the screen. I regretted saving the damned phone’s life. I tossed a bottle of water into the passenger side of my jeep and climbed in. The sun was shining and it looked like the Karma gods had taken pity on me and given me enough time to drive through Starbucks. As I pressed the cup’s lid to my lips the image of Locke entered my mind. Just the thought of him reignited the feelings from last night. Warmth spread deeper in my belly as I replayed our extracurricular activities. His strong hands on my bare skin, his soft lips pressed against mine…. The concrete walls of the base flanked by the Forty-fourth wing’s blue and gold insignia smacked me into reality. An uncomfortable tingle started at my cheeks and shot through my body as I neared the barriers that staggered the entrance. I handed my identification card to the security guard and blinked several times waiting for my dream to end. “Have a good day, ma’am,” the young airman at the gate said with a salute. I sharply returned his salute and realized that doomsday had arrived, but maybe it wasn’t as bad as I anticipated. Taking a deep breath, I donned my game face. A stupid sunny smile would not win me any points among the most fierce and competitive group of guys in the Air Force. I rolled my shoulders back and stood up straight with a brief pep talk. For the next eight hours, I was a woman on a mission. 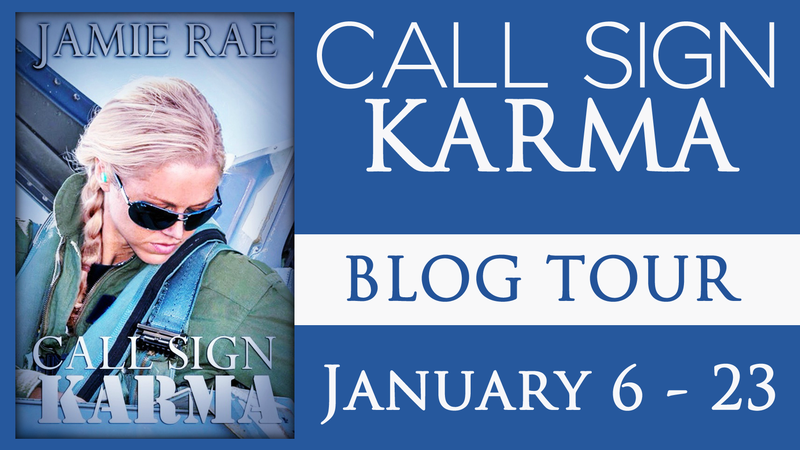 Posted on January 8, 2015, in Blog Tour and tagged Blog Tour, Call Sign Karma, Excerpt, Giveaway, Jamie Rae. Bookmark the permalink. Leave a comment.